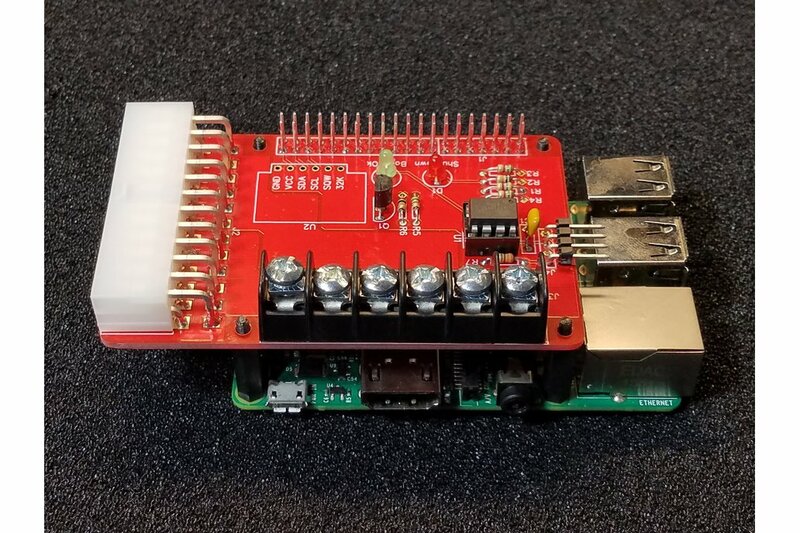 This big brother to the Mini ATX PSU allows you to power your Raspberry Pi and add-on project boards at much higher currents using inexpensive desktop power supplies while being able to enforce controlled shutdowns of the Pi's operating system to aid in preventing the corruption of valuable disk files. Additionally, the Mini ATX PSU-HP monitors the Raspberry Pi so that, in the case that the Pi is shut down by an application or from the command line, the desktop power supply will also turn off. Uses inexpensive off the shelf ATX desktop supply. Works with 24 pin ATX connectors. Enables the operating system to perform controlled shutdown and reboots to minimize disk file corruption. You can program the Mini ATX PSU-HP so that it will automatically reboot after a power failure if it was previously turned on. Screw terminals break out high current +12 VDC and +5 VDC for user projects. Voltage rails are designed to handle up to 20 amps each (see section entitled “Important Warning”). PCB is 2oz copper with ENIG finish. Uses high-quality Samtec and Molex connectors. 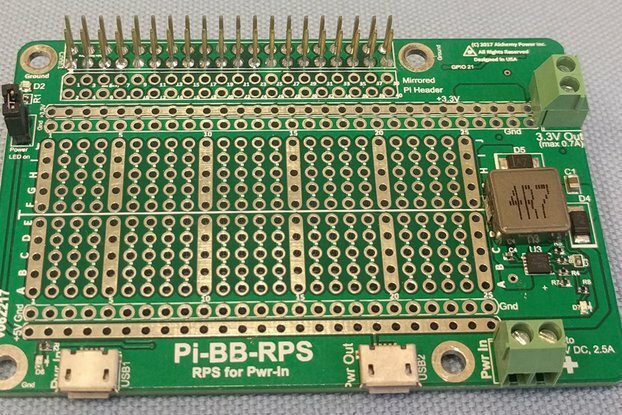 40 Pin GPIO stacking header allows the use of other HAT conforming boards. Program Mode: By default, the Mini ATX PSU-HP is programmed to not auto-reboot after a power failure if it was already turned on. This is to maintain backwards compatibility with older model units. If you wish to have the Mini ATX PSU-HP automatically reboot after power is restored, then please refer to the programming instructions in the manual. 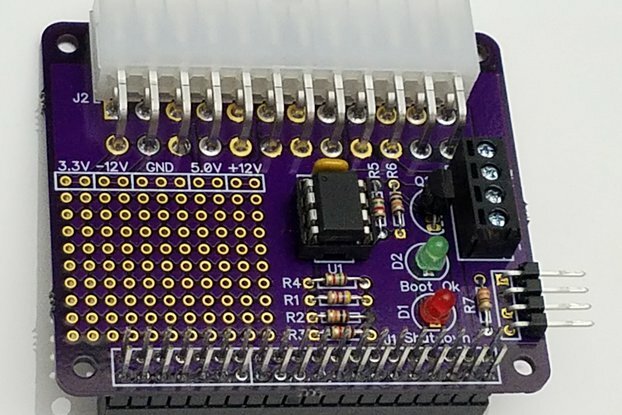 Power Off: On-board microcontroller, powered by the desktop 5Vsb line, waits for momentary power on button to be pressed. 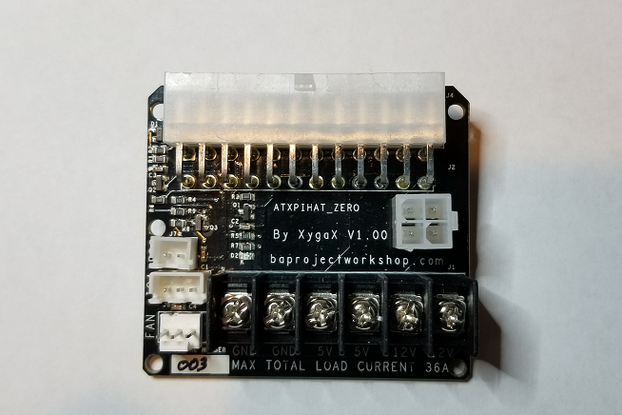 Although the Mini ATX PSU-HP has been designed to handle 20 amps of current on the +5VDC and +12VDC supplies from connector J3, live testing this current load has been a challenge. The connector J3 itself is rated for 20 amps on each screw terminal. And, the copper power traces leading from the Molex connector J2 to the screw terminal are at least 10mm wide on 2-ounce copper. So, it should handle 20 amps. However, without proper testing, we cannot guarantee that it will handle this kind of current. Be advised then that when you use this product, you do so at your own risk and that we will not be held liable for any resulting property damage, destruction, and/or personal injury. 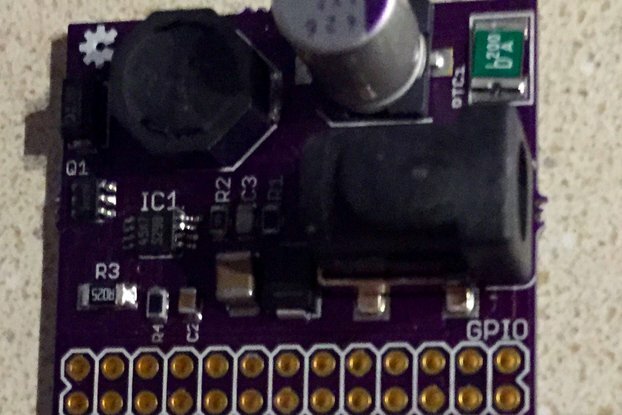 My projects often need multiple voltages in addition to the 3.3 VDC or 5 VDC supplies usually provided by the Raspberry Pi. Existing ATX type desktop power supplies provide the kind of power that I can use. 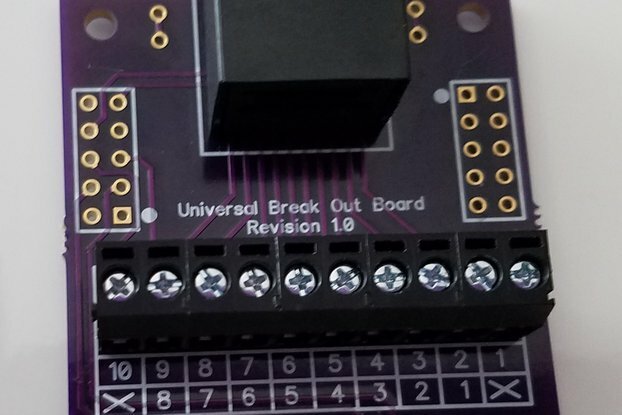 Additionally, I needed my board to be a HAT conforming board so that I can build controller stacks using the other boards I designed as well as third-party boards. I am very particular in using stacked configurations because a stacked configuration is physically and electrically more robust. Finally, I wanted to mitigate the chance of file corruption by just turning off my Raspberry Pi without doing a controlled shutdown. This board allows me to do this.